At some point while he was still young a girl named Mirald moved into his village and he was the first person to befriend her. The two grew up as good friends, Klarth pulling pranks on her and being there when she locked herself in a cellar for 3 days when another boy that she liked got married. Likewise, Mirald was aware of Klarth’s family problems and was sympathetic towards the subject. At the age of 18 Klarth attended the Alvanista Royal Academy along with Mirald. Klarth found his school life to be suffocating so he entertained himself by constantly skipping class and dating numerous girls. At one point he even tried to romance the school board’s daughter and earned himself a suspension. He also smacked the school director with a magic book, and over time gained a reputation for being both a trouble maker and a slacker at the academy. Klarth’s reputation did not bother him much however. He was adamant that he was going to live his own life, make his own decisions, and deal the consequences as they came. At that time he also worked as the assistant for the young and energetic magic professor Magnus Bradley. The two worked together on Professor Magnus’ summoning research. The existence of spirits was strongly denied among the academy scholars and Magnus was considered to be rebellious for pursuing the study of summoning artes. Klarth also introduced Magnus to Mirald and the two began to date. Magnus showed some reservations over dating her as she seemed more fond of Klarth. But Klarth insisted that it was fine as he’d never have feelings for a woman like Mirald and he felt confident that she really did love Magnus. As time went on Magnus began to plan proposing to Mirald once he succeeded in proving his summoning theories. On a snowy December day the two young men set up an experiment to summon and pact with Sylph, a spirit known for its gentle nature. Things proceeded smoothly at first until suddenly the room filled with darkness. At that moment Magnus realized that he had accidentally summoned Shadow instead. After the darkness cleared up Magnus had disappeared and was never seen by Klarth or Mirald again, leaving behind only his hat. After Magnus’ failed summoning attempt Klarth became devoted to the pursuit of summoning research. He had an old fortune teller paint a magical seal on his body which caused him a great deal of pain. He also began to dress very strangely and wear a large amount of jewelry. All of which was done to strengthen his bond with the spirits. Losing Magnus had taught Klarth that like spirits themselves he was a part of something greater and that there was a meaning to all things in the world. The academy was less than impressed with his new behavior though and showed disdain towards his new appearance. The other students and faculty considered his clothes and his continued commitment to proving the existence of spirits to be an insult to the school itself. They refused to listen to anything that Klarth had to say and eventually exiled him from the academic community. Klarth and Mirald were not going to let that set them back and continued their work even without the support of the academy. The decided to open their own school together as partners. Mirald gave Klarth Magnus’ hat and the two went back to work on their goals. Ten years later Klarth was able to perfect his summoning technique using ancient documents as the foundation of his own research. Over time he also gained a reputation for himself as a eccentric magic researcher on the continent of Euclid. It was because of this that the time travelers Mint and Cless sought his aid in their search to use magic to defeat Dhaos. Klarth was dismissive and insulting to the two at first, but eventually agreed to help them after Mirald chewed him out for being rude and thoughtless. With Mint and Cless’ help Klarth was able to meet and form a pact with Sylph. Sylph however informed Klarth that there would be little point in summoning unless the world tree Yggdrasil was saved. Realizing that if he did not do something to save the tree that all of his hard work would have been for nothing, Klarth agreed to continue aiding Cless and Mint in defeating Dhaos. Throughout their journey Klarth acted as a kind of leader of the group, often being the one to make plans on where to go next, explaining the party’s goals to other people, and keeping the group focused on whaat they needed to do. He also spent a good deal of the trip being picked on by Arche, who enjoyed poking fun of his insecurities such as not being able to naturally use magic as he lacked Elven blood and his age. After everything that he went through with Cless, Mint, Arche, Chester, and Suzu, Mirald was still at the back of Klarth’s mind though. Shortly before the final battle he even summoned Origin to use his powers to scry back in time and check on her. After seeing that she was still concerned about him, Klarth made it one of his top goals to return to her after the final battle with Dhaos, along with his original plan compiling a thesis of his finding on summoning artes and the spirits. Learning of Dhaos’ true intentions after his defeat made Klarth question if he and the others were truly the ones acting with the world’s best interest in mind. But in the end he stated they did what had to be done and that they should all act to honor Dhaos’ convictions. Shortly after he returned to his own time using the Eternal Sword after he promised to Cless that he would seal it away in the past. Klarth later completed his thesis on the study of spirits and summoning artes and presented it to the academy. Still refusing to accept the existence of spirits the spirits, the scholars there responded by burning it in front of him. After that Klarth lost his drive to continue his work and began to drink heavily. Mirald, seeking to inspire Klarth to not give up on his work, left on a journey at that point to continue his research on his behalf. She was injured in the process, but the twins Mel and Dio managed to bring her back home to Euclid after meeting both her and Klarth during their journey. Klarth confessed tafelt that it was his fault that Mirald’s career was ruined. But Mirald reassured him that she was always happy helping him with his work and that she wanted to be there for him. Klarth, feeling re-inspired by Mirald’s action, agreed to help Mel and Dio in their own journey, aiding them in meeting Basil and pacting with spirits. When Cless asked Klarth to help scold Arche for getting drunk while she was underage, Klarth stated that the only thing she really did wrong was get hungover. His first name was changed to “Claus” in the official localization for Phantasia. Klarth makes numerous bitter jokes during the future arc of the first game about how he’s definitely dead in that era. At one point when the party thought they had seen a ghost he even suggested “Mwahahahahahaa… Maybe it was me!”. Klarth made the same “BECAUSE YOU’RE BALD! ?” joke that Arche did upon initially asking Magnus why he always wore the hat. While Klarth was using Origin to look back in time in one of the joke audio dramas, Mirald found his naughty magazine stash cleaning under his bed. After she began to tear them up Klarth ran to Cless of the party saying that they needed to hurry and defeat Dhaos as soon as possible. I’m not aware of any of the other sequels or side materials stated what Klarth did with the Eternal Sword after he returned to the past, but in the ToP novel “Maken Ninpou Chou” he sealed it in a cave on the Euclidean continent behind numerous traps. His strongest weapon in the PSX version was the Namco Gamer; a gaming magazine with Pacman on the cover. 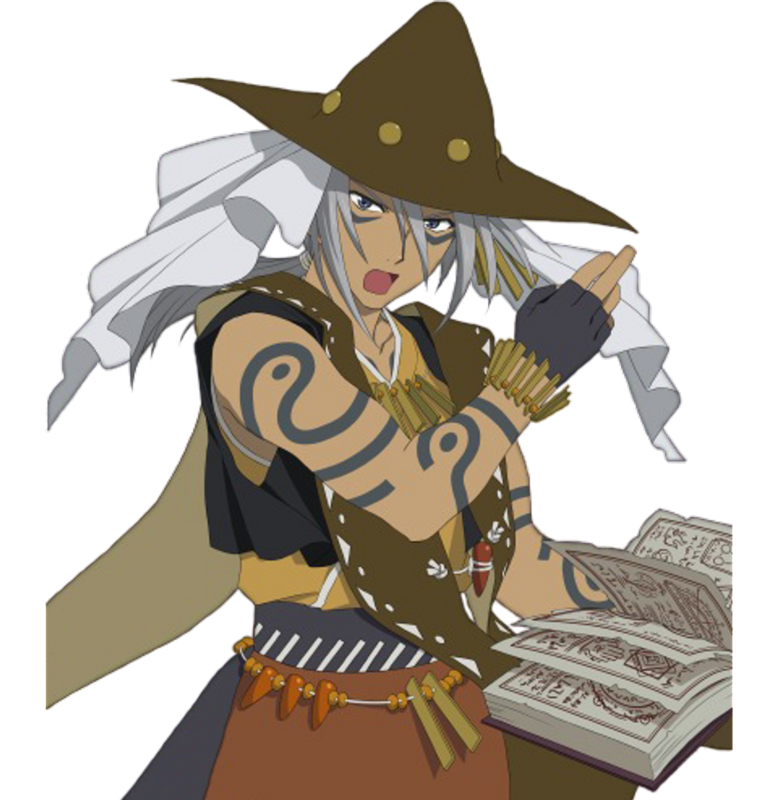 Klarth’s design was changed the most for the OVA, having his jewelry removed, his tattoos simplified, and the white cloth on his hat turned to a few feathers. Narikiri Dungeon originally had Klarth stating that Mirald was his life partner near the end of the game which the Japanese fandom took as a proposal, but it was left out of the Narikiri Dungeon X remake. Whenever Klarth tries to explain where his hat came from during skits he is interrupted. His descendant Fulein K. Lester is also a summoner and the main character of “Summoner’s Lineage”.